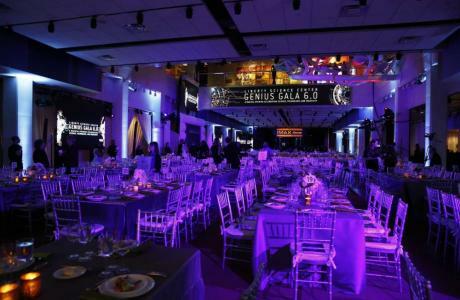 Hold an unforgettable special event at Liberty Science Center. Our staff of experts can help you design a fabulous occasion, stress free. 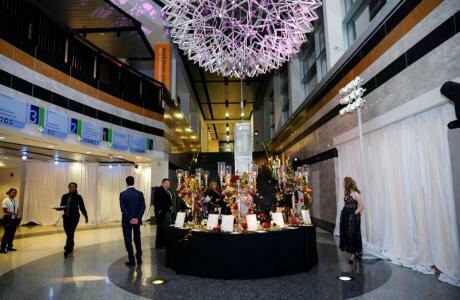 Our one-of-a-kind spaces are ideal for any important Jersey City event, from business conferences and new product announcements to board meetings and galas. We also host stunning weddings and over-the-top bar and bat mitzvahs. 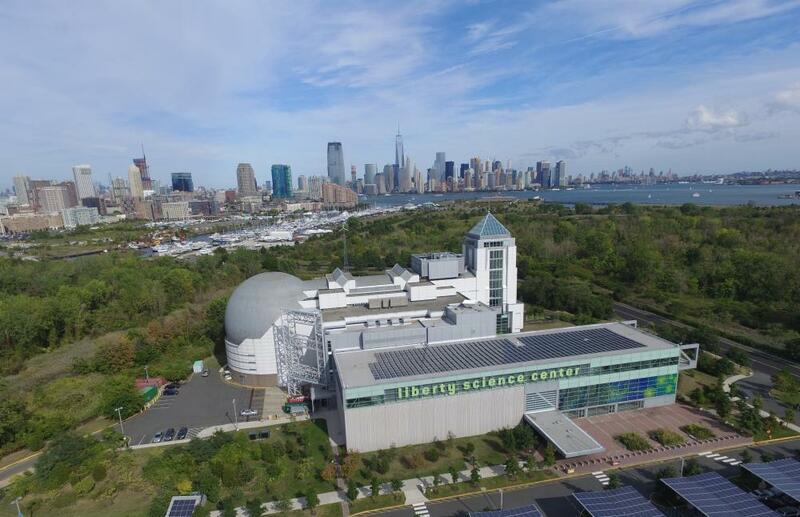 Liberty Science Center is a 300,000-square-foot learning center located in Liberty State Park on the Jersey City bank of the Hudson near the Statue of Liberty. The Science Center houses 12 museum exhibition halls, a live animal collection with 110 species, giant aquariums, a 3D theater, live simulcast surgeries, hurricane- and tornado-force wind simulators, K-12 classrooms and labs, teacher-development programs, and the Western Hemisphere's largest and most technologically advanced planetarium—the Jennifer Chalsty Planetarium and LSC Giant Dome Theater. Year-round, daytime, evenings or weekends. Some restrictions apply based on normal public operating hours. PSE&G Court	 This bright, modern space features awe-inspiring artwork using light and motion and the original 18 foot Hoberman Sphere. 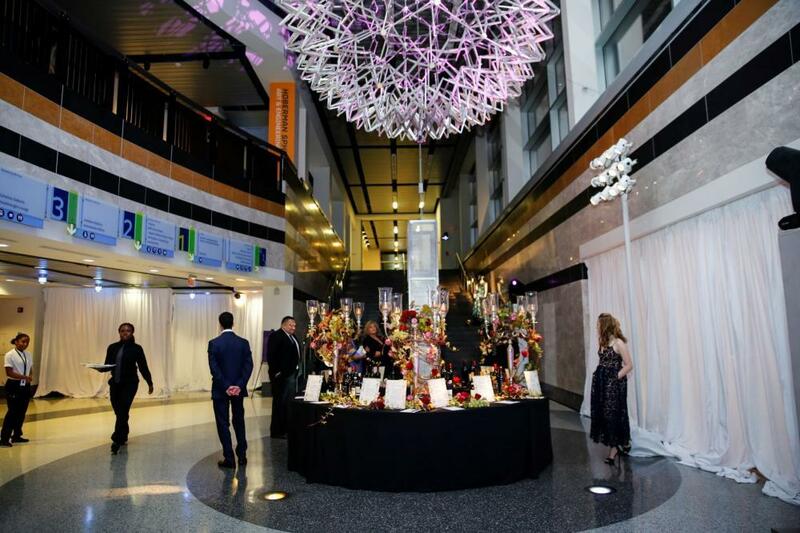 PSEG Court’s cool color palette and beautiful terrazzo floors compliment any event décor perfectly. 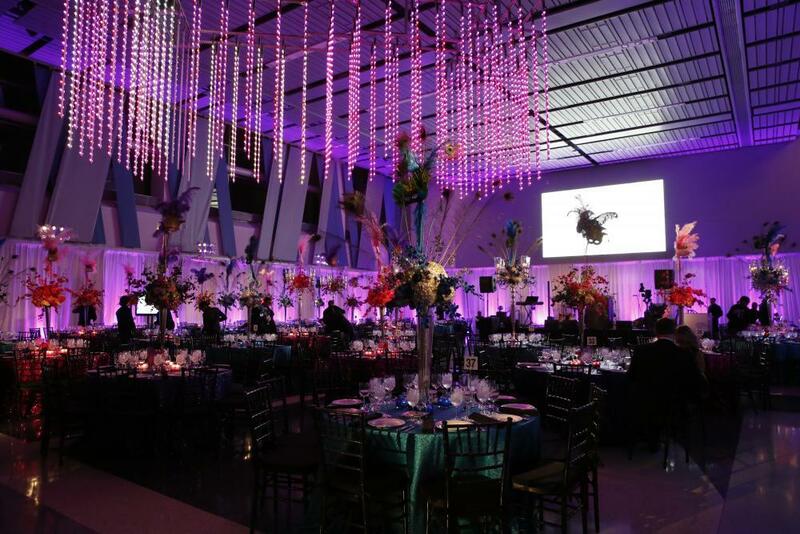 Accommodating up to 300 guests seated with a dance floor, PSE&G Court is an ideal space for your special event. Skyscraper Exhibition	 Home to the largest exhibition on skyscrapers in the world, this bi-level exhibition on skyscrapers will take your guests on an exploration of the science, technology, planning and construction behind these amazing structures through a variety of presentation formats. 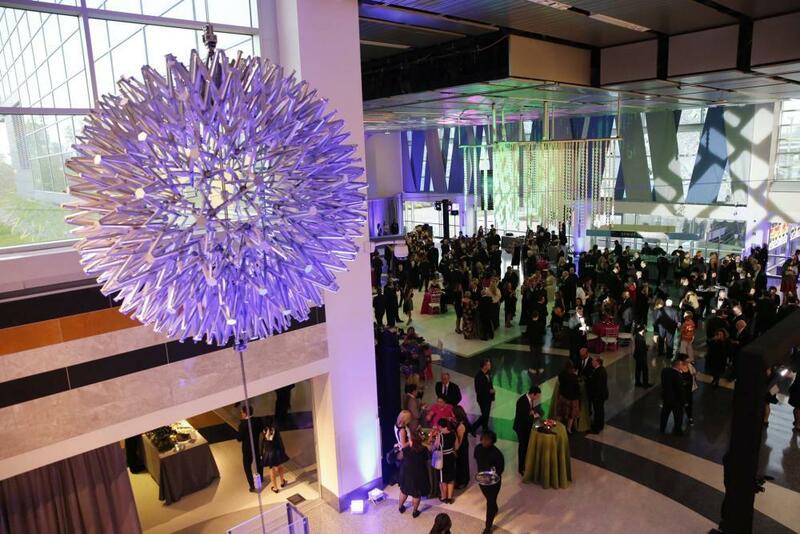 Your attendees can even safely walk along an I-beam elevated high above the gallery floor. SURE House Exhibition	 This storm-resistant, energy-efficient little beach house, designed by Stevens Institute of Technology students, won the 2015 Solar Decathlon sponsored by the US Department of Energy. It uses 90% less energy than a traditional home and becomes a hub for emergency power to other buildings in the aftermath of a storm. This space can accommodate 30 guests for a reception and seats 20 guests. Forum- Center for Learning and Teaching	 This 3,700 square foot space is located in the center of the Center for Learning and Teaching. The large open space can accommodate 200 guests theater-styler style or at round tables. The Forum comes equipped with a 5500 lumens projector, remote controlled projection screen, 2 plasma monitors, computer, wireless & hardwire connections & a built-in sound system. Private restrooms are conveniently located off of the Forum. Alpha Lab - Center for Learning and Teaching	 The Alpha, Gamma, Delta, Pi or Innovation Lab are ideal spaces to host small meetings, or breakout sessions for larger meetings. Each lab has a distinct science-oriented environment and can accommodate 30 to 50 guests. Interactive Theater - Center for Learning and Teaching	 The Interactive theater is located on the first floor of the Science Center and features 100 seats and extensive AV capabilities. Governors Hall	 One level up from PSE&G Court is an 11,000 square-foot expanse known as Governors Hall. With its large open space and high ceilings, Governors Hall is the perfect setting for large dinners, presentations or gala/fundraising events. 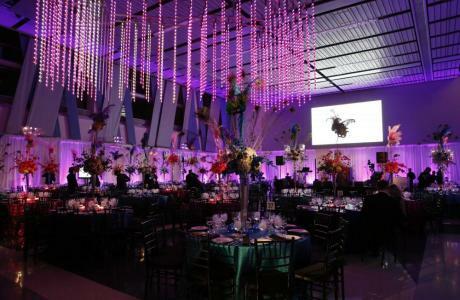 Accommodating up to 650 people seated, this free-flowing space can be transformed to compliment your event perfectly. Group Dining	 Group Dining can seat up to 300 guests comfortably at picnic-style tables or 200 guests at round luncheon tables. Natural sunlight and big windows offer a bright atmosphere to match any décor. Left Cafe bank	 The Café Banks are located on the 2nd floor behind Café Skylines. These wonderful spaces are almost two walls of windows, with a view of Liberty State Park and lower Manhattan. These rooms come equipped with Café style tables and chairs, but round tables can easily be set up for a more formal dining experience. Guests will enjoy fresh air and beautiful views of Liberty State Park, Jersey City & lower Manhattan from Skylines Terrace, conveniently located off the Cafe Banks. When combined, the Banks can accommodate up to 100 guests seated. Jennifer Chalsty Planetarium	 Get ready to fly through the universe, roam distant planets, and navigate asteroid fields. The Jennifer Chalsty Planetarium and LSC Giant Dome Theater is the Western Hemisphere's largest and most technologically advanced planetarium. Our 88.6-foot full-dome view of the night sky and distant galaxies is more expansive, immersive, and accurate than any other planetarium's on our side of the planet. 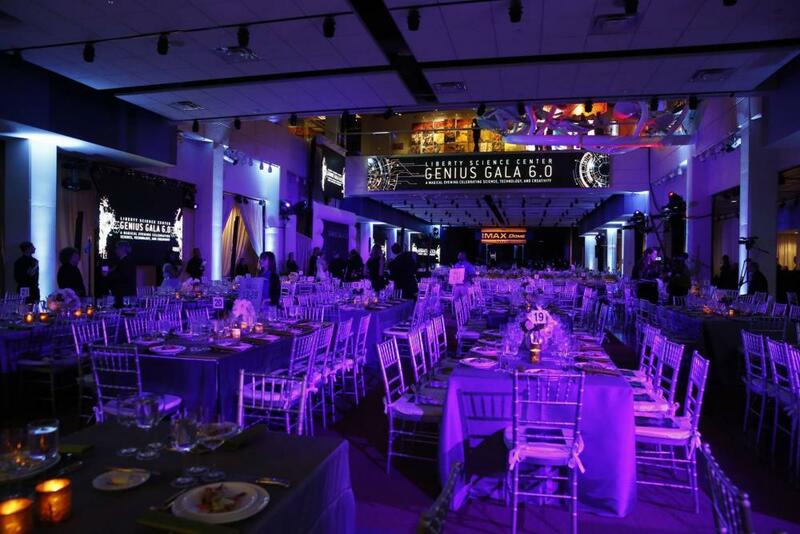 In addition to exhilarating planetarium presentations and giant-format movies, the Jennifer Chalsty Planetarium and LSC Giant Dome Theater can be used to produce original content for corporate events or conferences. Joseph D. Williams 3D Science Theater	 The JDW Theater seats 285 and has a 40-foot stage, a multi-use projection booth, and an 18-by-31-foot high definition screen. It is available for everything from awards ceremonies to performances, or treat your guests to a featured 3D film. I-Explore	 Children ages 2 to 5 (with their grown-ups) learn about themselves and their world in a safe, stimulating and engaging interactive environment designed especially for them. In this exhibit, kids use a rubber mallet to rock out on the Rock Xylophone made from five large hanging stone slabs and use an air cannon to launch a ball through a 2 story ball machine maze. Kids will also enjoy clambering up different levels of the Climbing Challenge, and building and testing a race car on the Test Track. Stanton Garden	 This lovely space is accessible from the 2nd level LSC and features gorgeous views of Liberty State Park and the Statue of Liberty. Governors Garden can hold up to 150 guests seated theater style. Lawn	 Situated to the east side of the Liberty Science Center is the gorgeous lawn area. Though the capacity varies with the setup of your event, all your guests will be entertained by the famous Manhattan skyline and Liberty State Park as their backdrop. This outdoor area is great for anything from a corporate barbecue or picnic to an elegant sit-down dining experience. A Liberty State Park event permit is required to use the lawn space for a special event. Below please find the fees associated with this permit. 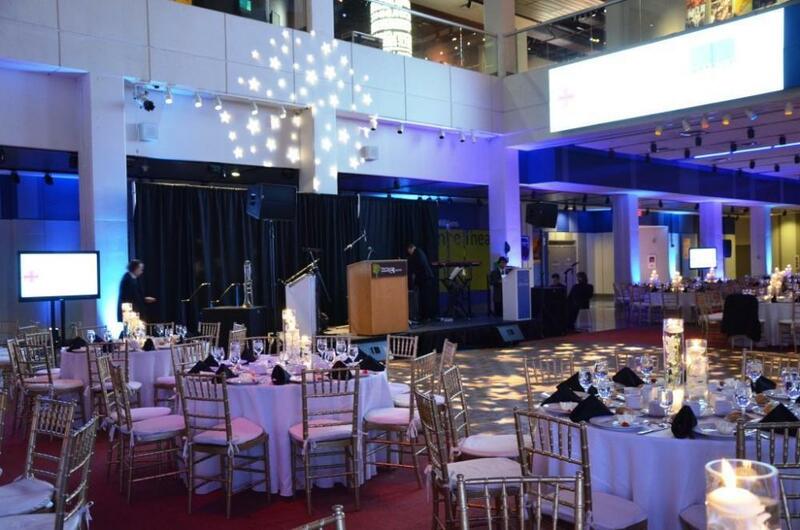 Liberty Science Center requires a tent rental for all catering & audio-visual equipment, a guest tent is optional. Per New Jersey State Law alcohol service is not permitted within the lawn space. EY Conference Hub	 The EY Conference Hub is a fully equipped smart room, which houses all the audio visual aspects to fulfill your meeting requirements. This room comfortably seats 50 classroom style, although the tables and chairs can be moved to accommodate any setup. 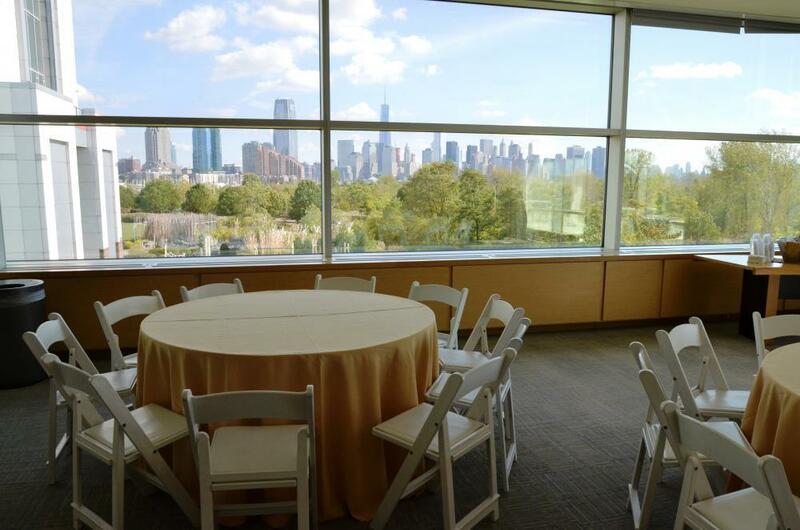 The space also features beautiful views of Liberty State Park. Josh Weston Board Room	 The Josh Weston Boardroom is a fully equipped smart room, which houses all the audio visual aspects to fulfill your meeting requirements. This room comfortably seats 40 guests around our custom, permanent U-shaped table. The east wall of windows has a breathtaking view of the New York skyline, as well as a balcony for your guest to enjoy. This room is a great space for corporate meetings and team building activities, as well as luncheons. EY Conference Hub and Josh Weston Board Room	 The elegant 45-person Boardroom and 80-person Conference Hub can be rented individually, or combined into a single space to accommodate 150 guests. Both feature extensive AV capabilities and views of lower Manhattan. 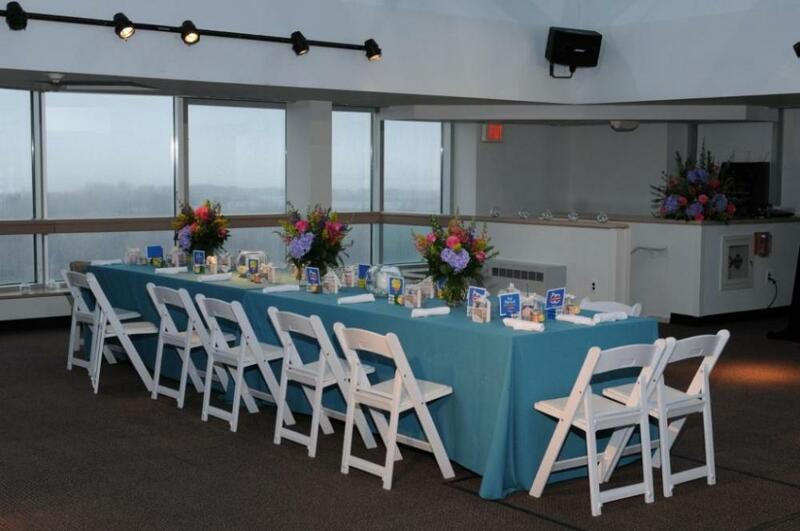 The Board Room includes access to a large terrace that overlooks the Statue of Liberty. Conference Room 1	 Located within our administration office the Conference Room provides a quiet place to host a meeting or host a brainstorming session. 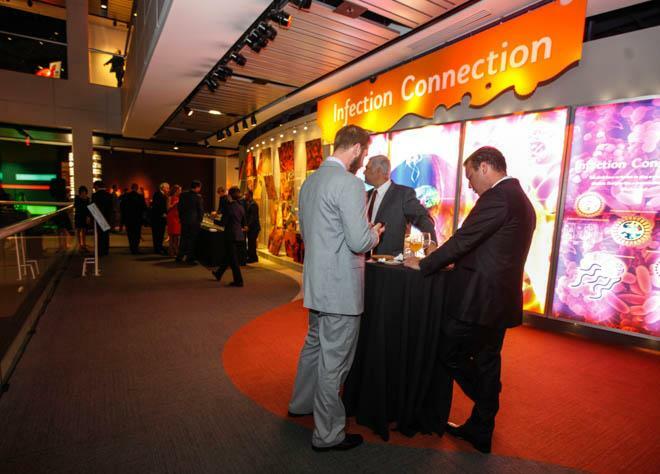 3rd Floor Exhibitions	 Your guests can create electronic graffiti and laugh out loud at “language karaoke” in our Communication gallery; visit hundreds of animals in Eat & Be Eaten; and learn about health and perform real lab experiments at Infection Connection. 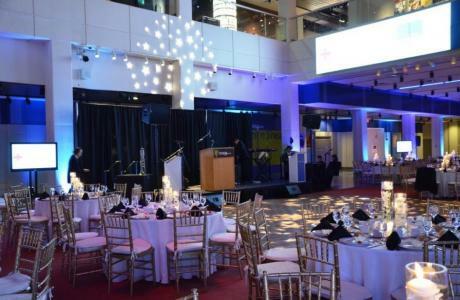 Daring party members can even crawl through the 80-foot long, pitch black Touch Tunnel Maze, or scale the Infinity Climber suspended 35 feet above the atrium floor. 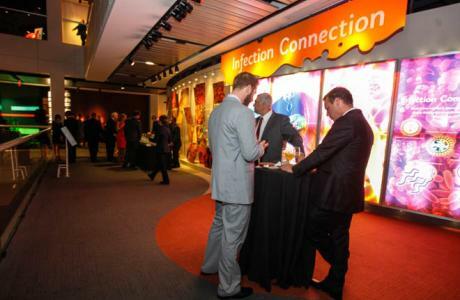 4th Floor Exhibitions	 With more than 20,000 square feet of exhibit space, the Fourth Floor offers a variety of engaging experiences. Dine among huge tanks of fish and enjoy spectacular views of Manhattan in the Our Hudson Home exhibition. Energy Quests offers the chance to learn about energy from water and wind to nuclear and fossil fuels. Also located on this floor are two featured exhibition spaces. Observation Tower	 The Observation Tower is a 360-degree, glass-enclosed pyramid with panoramic views of New York City, Ellis Island and the Statue of Liberty. Accommodating up to 80 for a reception and 70 seated, this space is perfect for an intimate dinner, an elegant cocktail reception or an innovative business meeting. Our onsite caterer, CxRA (Catering by Restaurant Associates) is committed to providing an unparalleled level of service and cuisine. CxRA has earned a reputation for uncompromising quality.